It is located on the second and last floor of an medieval building of the typical via del Riserraglio, in one of the most ancient districts of the city where there was the Roman era forum and where, in the Middle Ages, there were flourishing handicraft workshops and big papermaking factories. The flat has been finely renovated and furnished taking great care of the details, trying to recreate, where it was possible, a medieval style furniture. It has a beautiful high ceiling with terracotta tiles, authentic beams and wooden truss beams, and parquet. The wooden furniture, the light fixtures, the lanterns, the copper and wrought iron torches are all craftsman works, as well as the doors, faithful reproductions of ancient models with typical bolts. The walls are adorned with reproductions of medieval arras of the Flanders. There are a little balcony and a little terrace with a charming view on Tivoli and the valley of Vesta below. The windows of the bedrooms overlook on the typical and quiet piazzetta del Riserraglio. FREE PARKING AT 250 METERS FROM THE APARTMENT! Once we realized we weren't in Kansas anymore we embraced this ancient town. The apt was very comfortable,clean ,warm, modern , roomy with decor that was to point with medival era, like 1500 AD. Hard to image ? Yes but we were soaking up history with a latte. Hello, does it get any better. Our hostess Allessandra is named after parts of Tivoli and she is fantastic. Every need was met.We recommend it highly. Stunning character property, with a warm welcome from Alessandra. Close to amenities and a train journey to the centre of Rome. The apartment had everything we could have required for our stay, whilst being clean and tidy. Alessandra was a fantastic host. If you want a real Italian experience this is your place. Loved it all. The apartment is huge and terrace view it beautiful. I wanted to cry when it was time to go... and Alessandra was so easy to work with! My 3rd trip to Italy and Tivoli is not to be missed!!! Staying here you feel like you are living in a medieval movie scene. 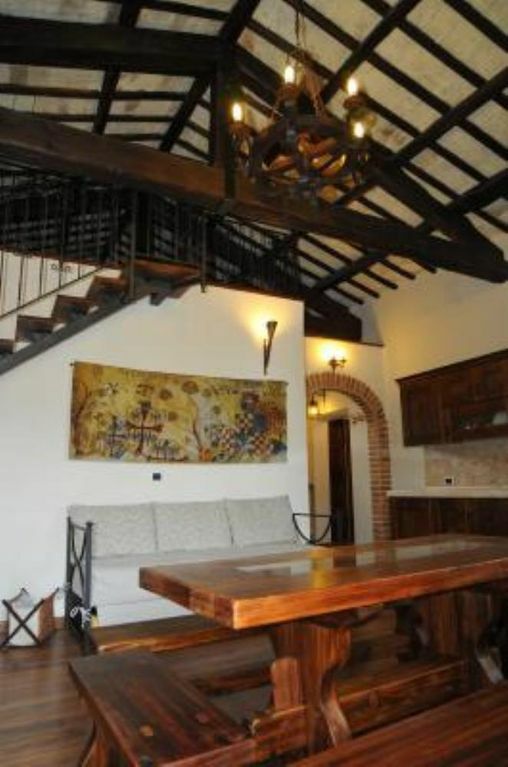 It is a beautiful apartment in the center of ancient Tivoili. Walkable to incredible sites of Ancient Rome. It is near the train station so you can get there from Rome and enjoy the apartment and go to a different restaurant every night like we did. The most interesting pizza we had is at Alice take out. A must try for lunch. I highly recommend this apartment but you must be able to take steps up to the apartment and also around the scenic little town of Tivoli. Our family of 5 loved the place. As soon as we drove down the streets of Tivoli and walked up the stairs to the apartment, we felt like we were having an authentic Italian experience. The apartment is excellent and well-stocked. It is modern, clean, and comfortable and right in the heart of narrow old streets and homes. Alessandra is a fantastic host. She helped us upon arrival for restaurants and trip ideas. Before our departure, she went out of her way to assist us in various tasks. She cares for her clients and took time to make us have a great experience. The train is close for day trips to Rome and two of the villas are within walking distance. I highly recommend this apartment. This charming apartment was right in the mostly pedestrian old part of Tivoli with easy access to nearby parking. It was such a delight to climb up the stone steps from the cobbled alley, through the apartment and then onto the rooftop patio that gave out onto a fabulous view of the old town, the hills and the plane of Rome when we first arrived. The apartment was perfectly clean and well maintained. Alessandra was lovely and very helpful and informative about local restaurants and markets. We were only there for a few days and planned to see the Villa D'Este and Villa Adriana and she helped us enormously by knowing the opening days of each place, saving us from missing out on seeing the Villa D'Este. She also pointed us the the steep and narrow streets where the Presepi ?? Creches are displayed in the windows at the holidays. This was the perfect place for us take a relaxed approach to our arrival in Italy, wandering around the streets, eating marvelous food, being awed by the beautiful gardens and incredibly rich history. I would certainly recommend this apartment to anyone who has the great good fortune to spend time in Tivoli. (Text automatically translated) Restaurant "Blue Elephant" via San Valerio No. 3, just 100 meters from the apartment. Trattoria "Il Gallo d'oro" in Via del Duomo No. 53, 100 meters from the apartment. Pizzeria "La Stazione" in Viale Mazzini, 500 meters.